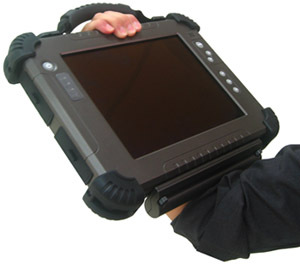 Winmate Launches New Rugged Tablet PC Series-Hot-swap Second Battery for Extended Operating Hours! Everyone wants as much processing speed as possible, especially in mobile units. 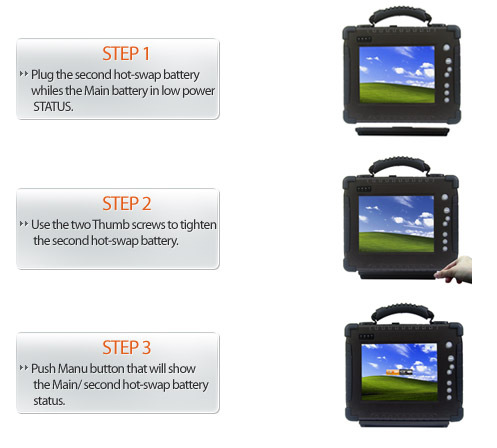 The battery life of our Rugged Tablet PC has been extended by our new function to change the second battery without shutting down your system. We believe it will bring immense benefits and reliability in your mobile application. The Hot-swap second battery is secured by two large Philips screws ensuring the battery will never loosen. It has Li-Ion 2600 mAh which supports half the operating time of the main battery. Supports 8.4 inch to 12.1 inch with IA80 (Intel 945GSE) and I880 (Intel 945GME) platform. Back-up external Battery Pack quickly exchanged by two adjustable screws. 2600mAh (11.1V) battery capacity can extend half of its original operating time. Comfortable ergonomic design for your wrist. Dual battery status indicator in Tablet PC shows which battery is in operation.